Ross Peddicord (the dynamic new Executive Director of the Maryland Horse Industry Board), Crystal Kimball (Equiery publisher) and I were speaking to a group of agricultural leaders with the LEAD Maryland Foundation, Inc. this month about the equine industry and as I spat out a series of impressive numbers on the size of the Maryland equine industry I reminded myself that some people glaze over when you throw numbers at them. It is not until you relate those numbers in a truly palpable way that people actually grasp the magnitude of impact. So with that said, I am going to try my best to relate to you some of the more interesting findings of the 2010 Maryland Equine Census, and since this is The Equiery’s Trail Riding issue I am going to focus on some of the findings that matter to those of us that benefit from riding on public lands. QUESTION: What is 587,000 Acres? A) The amount of land in Maryland that is owned, controlled, or impacted by horse owners. B) More land than is in St. Mary’s, Talbot and Howard Counties combined? C) The amount of land that would be needed if you were to build 15,800 football stadiums the size of the Raven’s. Take a number like the 587,000 acres of land in Maryland that are owned, controlled, or impacted by horse owners. Yeah, that is a nice number–but it has a good deal more impact when I tell you that you Maryland horse owners control more land than is located in Anne Arundel and Prince George’s Counties combined, or the industry controls more land than St. Mary’s, Talbot, and Howard Counties combined, or the fact that you could fit over 15,800 Raven’s stadiums on the land controlled by Maryland horse owners; then it is a little easier to grasp. Additionally they found out that 88,000 acres of Maryland land is entered into land preservation programs thanks to Maryland horse owners. That amounts to enough land to build 4,400 Orioles (Camden Yards) baseball stadiums. These figures are mind-boggling in terms of the impact of horse owners on Maryland and should truly show how the rise and fall of Maryland horse people can impact this state. However, I want to admit something…the data we have is limited. In fact, in the 2002 Maryland Equine Census we had a little bit more data than we do from the 2010 census. Now that I have the trail riding community up in arms, let me explain a little bit about what we do know and why the Maryland Horse Industry Board decided to take a different approach in 2010 than it did in 2001. Back in 2002, the Board reported that more than half of the locations on which horses were housed (I am going to call them stables but keep in mind some of these “stables” were not stables) in Maryland utilized Maryland public lands, with 11,800 stables using public lands for trail riding. Sixty percent (7,080) of those stables noted using state, national, or regional parks, twenty-six percent (3,068 stables) rode on state, or national forest land and twenty-four percent (2,832 stables) utilized wildlife management areas. Additionally, ninety-four percent (11,092 stables) utilized private lands for trail riding. So what did all these 2002 numbers mean? Well, all it meant was that trail riders used public lands… not exactly a revelation. So, for 2010, the Board wanted to see if it could collect more useful data than something that seemed so obvious. Just prior to MHIB issuing the 2010 Census, the Governor appointed a new representative to serve on MHIB in the position of representing trails and parks, Ron MacNab. Ron has been a fantastic representative to the Board for the trail riding community. It helps that he is the president of Trail Riders of Today (TROT). Ron had barely had a chance to get settled into his new position when he had to tackle the issue of what kind of trail and/or land data did we really want from the census. After some long discussions, Ron had the foresight to see that the number of stables utilizing lands for trail riding (regardless of whether or not it was an interesting number, or if it went up or down over the past eight years) was less relevant than “where” trail riders rode. As such, the question that was asked in the 2010 census was related to where the census participant rode his or her horse. That information has not yet been released publicly but when it is, it will highlight just how important each of our public riding areas are, data which should also be useful for park policymakers as well as trail enthusiasts. However, there is something that is perhaps even more important in the 2010 census, something that recreational trail riding enthusiasts will, I hope, embrace. 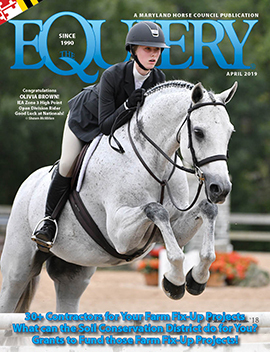 For many years, the equestrian community has tried to segment “trail riders” as a discipline or a sporting group unique unto itself, such as “flat track” people are different from “the trotters,” and “eventers” are distinct from “show hunters.” Saddle seat equitation is distinct from hunt seat equitation; barrel racing is distinct from dressage. Horse people tend to fall into one of the above groups, but rarely more than one of the above groups. Thus, we have a natural tendency to try to distinguish “trail riding” as its own genre, but I would argue that it is a distinction without a difference, as the fact is that almost all horse people, no matter what they ride or how they ride, are–at one time or another–trail riders. And certainly, no matter what the discipline, we are all users of public land. If you never go on a trail ride, but you ever show or compete at the Prince George’s Equestrian Center or Fair Hill, you use public land. If those equestrians who consider themselves to be “trail riders,” distinct from other disciplines, were to include in their numbers all users of public lands, no matter the primary disciplines of the riders (or horses) or the primary purposes for using the land or the trail, think about the ensuing power of those numbers!